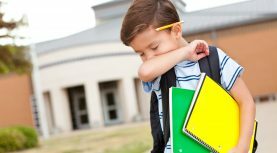 Whether you’re watching the Super Bowl as a family, or making plans for your star quarterback’s upcoming birthday party, knowing how to make a football cake without a fancy pan can be a beneficial skill. I’ve made one for a birthday party, school event, and Super Bowl party in the past few years, and the simple slicing of an unfrosted cake allows you to create a football shape that never fails to impress everyone. 1. Using your favourite boxed mix or cake recipe, bake a 10-inch round cake following the package or recipe directions. Allow to cool for 5 minutes, then remove from the cake pan and cool completely on a wire rack. 2. Place the cooled cake on a cutting board or countertop and slice out a two-inch strip from the middle of the cake. This is easiest to do if you measure four inches from the top of the cake, and four inches from the bottom, and remove the middle section. Set that piece aside. 3. Place the remaining two pieces of the cake together to create a football shape. 4. Liberally ice the cake with chocolate frosting and place it in the fridge or freezer for a minimum of 30 minutes, or until the icing hardens slightly. 6. Use the white icing to add the laces and stripes. Voila! 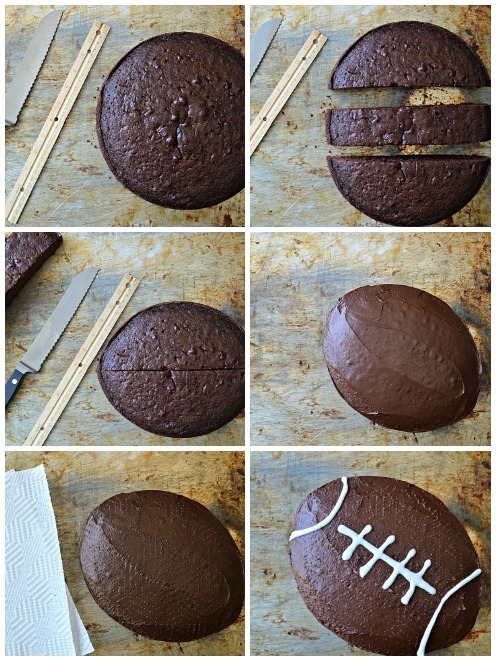 A simple football cake with no specialty pan required. You can serve the cake as is on a bed of green-tinted coconut made to look like grass, or alternatively place the football-shaped cake on top of a 9″ x 13″ cake that’s been iced green. This will offer more cake slices and present more of a 3D shaped cake.